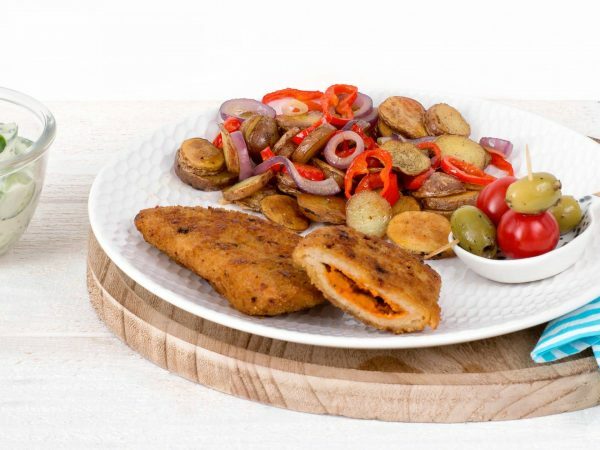 The vegetarian Greek Schnitzel is filled with a delicious Mediterranean sauce. Very tasty with pasta dishes and has a crunchy crust. A Greek Schnitzel weighs 100 grams. Water, 25% Greek sauce (cheese (milk (lactose), salt, starter, vegetarian rennet, lipase, acidity regulator (E270)), sweet pepper, water, cashews, vegetable oil (rapeseed, sunflower), onion, sugar, salt, modified starch, garlic, herbs and spices, flavouring, colour (paprika extract), stabiliser (E415, E412), preservative (E202, E211, E223), acid (citric acid), antioxidant (E300), lemon fibre), 14% vegetable protein (soy, wheat gluten, pea), breadcrumbs (wheat), egg white*, palm fat, wheat flour, sunflower oil, modified starch, flavouring (wheat, celery), salt, milk protein (lactose), dextrose, starch (wheat, corn), sweet pepper, herbs and spices, mineral (ferrous fumarate), vitamin B12. * Free-range eggs. Produced in a facility that processes peanuts.